Boneset, Indian sage, crosswort, thoroughwort – this native plant had many names and for centuries served as a treatment for colds and flu before it fell out of general use. It grows 5 feet tall and is easy to recognize by the way its stem appears to grow right through its large leaves. Boneset tea was unpopular with patients of the past because of its bitter taste, but boneset’s compact flowerheads are popular with bees and other pollinators. Now that fall has arrived, many Westborough residents begin thinking about getting their flu shots in the next month or so, but a century or two ago we might have been checking to make sure we had a native wildflower called boneset hanging to dry in our attics and barns. This home remedy grew conveniently at the damp edges of local wet meadows, paths, and roads. It still does so, although the meadows number far fewer now. 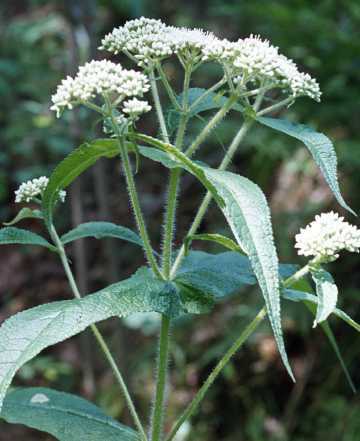 Boneset was well known and widely used as cold-and-flu remedy for centuries. People resorted to it during flu epidemics. Today it is much overlooked and usually regarded as a weed. Native Americans used it and passed their uses to the early European settlers, who called it Indian sage, among other names. Colonists introduced it to England for medical uses in 1699, before Westborough was even incorporated as a town. From 1820 to 1916 boneset was included in the U.S. Pharmacopoeia, a reference listing medicines that physicians prescribed. From 1926 to 1950 it was named in the National Formulary, a reference listing additional preparations that pharmacists dispensed. Even so, the plant was not popular, mainly because of the awful taste of the medicinal tea made from it. Children and adults alike dreaded catching cold or falling ill, not only because they hated being sick, but also because they hated the taste of this home remedy. But to be fair, some reports suggest that boneset tea was no more bitter than beer or ale. The plant itself is large, hairy, and coarse. It can grow 5 feet tall in sunny, moist locations such as wet meadows. The plant bears relatively flat clusters of small, fuzzy white flowerheads. That description might fit the flowerheads of lots of plants in our area, but boneset is easy to recognize, even when it’s not in bloom. How? By its unusual leaves. The leaves are large and crinkled, but here’s what’s really different about them: they look as if the plant’s stem is growing right through them. In reality, the big leaves grow around the stem and are united at their base so it looks like the stem is piercing the leaves. Once you’ve had a good look at these leaves, you’ll probably always know a boneset plant. If you look at a boneset plant for a while, you’ll see why the plant is also called crosswort. When you look down on the leaves, notice that each pair of leaves grows at right angles to the pair below it, making a cross. This crosswise arrangement benefits the plant because each pair of leaves gets plenty of sun, with no shading from the pair above it. Speaking of names, where does the odd name boneset come from? Medicinal uses that have to do with bones probably contributed to the name. In one, the large leaves were wrapped in bandages around broken bones to help them heal. This use may have come from the old-time belief that the appearance of a plant was a clue to the way people could use it. In this case, the united leaves suggested the mending of bones. Other fevers, such as malaria, were also treated with boneset tea. The plant had another name, thoroughwort (with “wort” meaning “plant”), because people believed it was very “thorough” in treating fevers. Some folks also treated rattlesnake bites by putting mashed leaves on the bite and giving the victim juice from the plant to drink. Does boneset actually work? One modern view is that it may have had some beneficial effects, but today’s medicines work better so boneset is no longer widely used. Boneset tea apparently serves as a laxative and a diuretic (which increases urine and water loss from the body), and the sweating that it causes may help with a fever. It may also help to break up chest congestion by thinning mucus, and it may offer some relief from muscle pains. Large doses can cause vomiting and are to be avoided in any case. Boneset blooms from July through October. You may still spot blossoms in early fall, although August is the best month for them. It was also the time when people collected them for drying. When you look at boneset in bloom, notice the small flowerheads. They’re actually densely packed collections of individual flowers, each with stamens (male pollen-bearing parts) and pistils (female parts where seeds mature). In this way, boneset is similar to a daisy, except that it lacks the white “petals” of a daisy. Instead, boneset’s flowerheads are similar to the yellow center of a daisy. This type of flowerhead gives boneset – as well as daisies, asters, sunflowers, and many other plants – an advantage over other sorts of flowers. The densely packed flowerheads make it very easy for bees, butterflies, and other pollinators to collect plenty of nectar and pollen from many flowers during a short visit. It’s very efficient for them. These plants are known as “composites” because what looks like a single flower is actually composed of many separate flowers. Because of its popularity with pollinators, this plant family has been wildly successful, with 23,000 species worldwide.